Introducing one of our newest PLUS+ locations, Red Roof PLUS+ Neptune Beach – Mayport, Florida! Red Roof PLUS+ Neptune Beach offers an outdoor pool, complimentary breakfast, a business center, connecting rooms, coin laundry, free parking, and coffeehouse-style coffee & tea in the lobby! All rooms include free Wi-Fi, a flat screen TV, extended cable television with HBO, hair dryer, ironing, desk and in-room coffee. 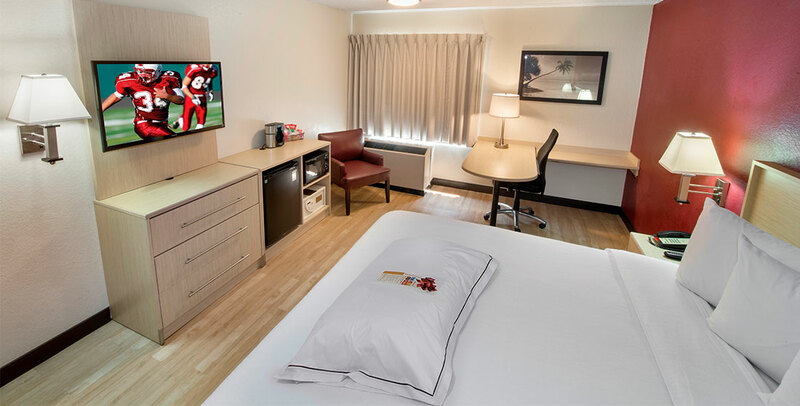 This Red Roof PLUS+ hotel also features Premium Rooms with breakfast and a snack ready in your room! Book now. If you are looking for an affordable beach destination, you have come to the right place! Experience the 22 miles of beaches, coastal neighborhoods, entertainment and great dining – all in Jacksonville. We are located just a short drive from the Atlantic Beach and Jacksonville Beach. Go for a swim, enjoy the local scenery, or stroll to one of the many local restaurants. Explore 43.3 acres of land along the Intracoastal Waterway at Cradle Creek Preserve (3.6 mi)! The preserve offers nature trails, elevated boardwalks, an observation platform overlooking Pablo Creek Estuary and a canoe landing pier. Kathryn Abbey Hanna Park (4.7 mi) Offers camping, 1.5 miles of sandy beaches, the Dolphin Plaza, biking/hiking trails, a 60 acre lake perfect for fishing, kayaking, pedal boating or canoeing, a splash park, picnic facilities and more! Feeling more adventurous? Head on over to Jax Surf and Paddle and pick up some gear to ride the waves. Jay Surf and Paddle also offers surf and stand up paddle board sessions. Just 1.2 miles away. Jacksonville Fairgrounds (14.5 miles away) is home to many year-round events. The kid-friendly and FREE Springing the Blues is April 6-8; Rockville Music Fest is April 27-29 (ft. Ozzy Osbourne, Avenged Sevenfold, Foo Fighters, Billy Idol, & more). When the ships come in to Mayport Naval Base, we offer a nearby clean & comfortable place to lay your head to rest. Wake up ready to greet your soldier. We’re just 6 miles away. Beaches Museum & History Park allows you to experience the world of the beaches pioneers. The museum offers interactive exhibits that brings the history of the beach community to life. Just 3.6 miles away. Downtown Jacksonville (15.6 mi) knows how to have a good time. Experience fine dining, exciting nightclubs and lounges, fantastic shopping, art gallerie, year-round events, entertainment and so much more! We’re next to Bono’s Pit Bar-B-Q and within walking distance of Wipeouts Grill, Culhane’s Irish Pub & Restaurant, Seafood Kitchen, The Fish Company, Two Dudes Seafood, and more! Other places to check out are Parsons Seafood Restaurant (0.08 mi), Panera Bread (0.11 mi), Whataburger (0.17 mi), Royal Palm Village Wine & Tapas (0.19 mi) & Roy’s Restaurant, 3 miles toward Jacksonville Beach. Visit a family member or a friend, explore the campus or attend an event at the following nearby universities: University of North Florida (8.6 miles away) or Jacksonville University (12.6 miles away).